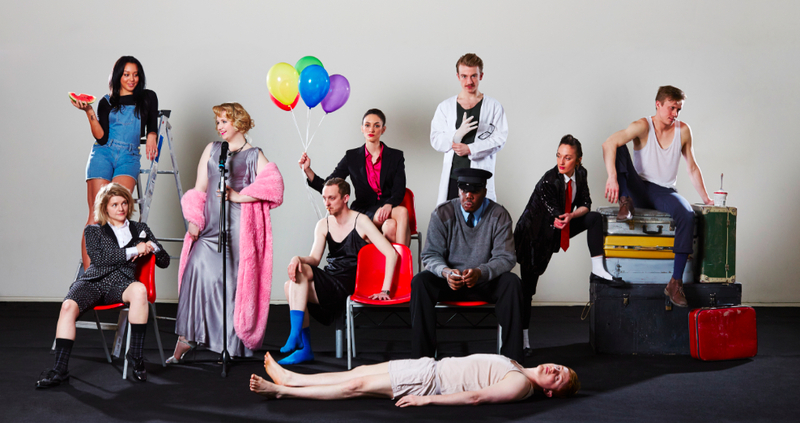 The words ‘Being Authentic’ are scrawled in thick black marker on the back of the stage in Secret Theatre Company’s ‘A Series of Increasingly Impossible Acts.’ One feels the idea behind the show though, is exactly not that– i.e. the cluster of actors aren’t being asked to be authentic, rather they spend- or the protagonist chosen by the audience spends, the next 75 minutes exploring what that might mean by being put through a series of devised exercises and tasks. If anyone spends anytime at all in a rehearsal room then they will feel at home here, not that this is to the detriment of the show, rather it is the point to be so intimate- contrary to what Fiona Mountford says in the Evening Standard, I think that this is what is meant by intimacy. The audience is closer to a performance than they ever have been before by feeling as though they are being exposed to that most sacred of all spaces- the rehearsal room- and the sense is not that dissimilar to Peter Brook’s The Valley of Astonishment. And in a way this show is very similar to that one. It begins with the protagonist, in this case Steven Webb, donning the gold cape and, by using his body as an instrument, trying to bend a steel pole, shut himself into a suitcase and overcome other physical challenges. The process is timed and the cycle, which involves extraordinary fighting bouts with other cast members where the winner is the person who defrocks the other- a metaphor for the stripping away of stereotypes anyone? begins again. I think I counted 3 cycles in the performance I saw. Not much happening you might think, but the spectacle- for that is what it is – is strangely exhilarating and clever. Clever because we are given a quick tour of the various forms of entertainment which involve a performer and an a audience, exhilarating because, even though we know some of these things have been rehearsed, we feel the freshness of something not performed before and not only that, a something that asks us the audience to look, in minute detail, at the action on stage and at the talented performers and the characters they may inhabit. Now Marat quotes ‘The important thing is to pull yourself up by your hair and see the world with new eyes.’ I can’t help thinking that this entirely represents what Impossible Acts is trying to do. I also found myself thinking about Peter Brook and his experiments and looking at life in a more concentrated form. Of course I never saw his play set in a drug den in a small room where the audience watched actors playing drug addicts where not a lot really happened, but this show got me thinking about it. It also got me thinking about Lyn Gardner’s recent article in the Guardian which was reacting to David Edgar’s worry that Britain is currently experiencing an anti-writer trend in theatre [the rendition of a scene from Romeo and Juliet is obviously there as a contradiction, contention, as a complication, given what is going on around it]. The show’s obviously a provocation. In a way which asks us to see life in a very crystallized sense. We get fragments of dialogue, memories, and very real experiences from the actor’s real life perhaps, or may be they are made up, we don’t know. And we get into these bits of scenes in between the physical exercises only for the other actors, who read off scripts, to screw them up and throw them away, exclaiming, ‘What’s the show about Steven?’ This is not 6 Characters in search of an author but one, and Elizabethan in its execution as with rude skill, Steven Webb moves freely between the inner and outer world, the world of emotions and thoughts and the world of the physical body and takes us with him. As an audience, we are at once objective, subjective, repulsed and drawn in and our sympathies; depending on the challenge enacted before our eyes, fly back and forth. Another critic implied that the show’s values- i.e. everyone working together, helping each other to overcome obstacles, is too obvious and simple. But the ensemble must be admired for coming to such a deep and telepathic awareness of themselves with each other. And the message is not trite, the things we most need in life, the things we most want and need from each other, are exactly that, obvious and simple and sometimes it needs to be pointed out in this way too.